Billy is a street urchin, a pickpocket, and a petty thief. Mister Creecher is a giant of a man whose appearance terrifies everyone he meets. Their relationship begins as a matter of convenience. But before long, a bond develops between these two misfits as they embark on a bloody journey that will take them from London northward on the trail of their target . . . Doctor Victor Frankenstein. It seems the good doctor had promised Mister Creecher a bride, and Mister Creecher will stop at nothing to get what he’s been promised. Nothing. 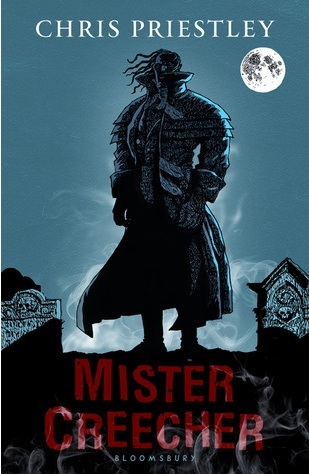 Perfect for fans of horror novels, this frightening new book from Chris Priestley reinvents a classic literary monster for a new generation of readers. I, silly little reader, didn’t realise actually how meta this book would be. But I’m getting too far ahead of myself, I’ll talk about the end later. Let’s start at the beginning seeing as I’ve heard it’s a very good place to start. The beginning of this book was ok. Mr Priestley did a great job of setting the scene; murky, Victorian Regency London (Thanks to Mr Priestley for correcting this! I apologise for my shocking historical knowledge!). I, for one, don’t think there is a better setting in any book. I just love it. The writing was a little grating, however. But once I got into the story, I was able to ignore those little niggles. It’s obvious that Mr Priestley knows what he’s doing with a horror story. The setting was grim, the characters were dastardly and the baddies were truly baddies. Also, Mr Priestley isn’t afraid of writing the bloody and gutty bits of the story. Which I loved. If you’re going to write a horror story, you can’t be squeamish. I really enjoyed the middle part of the story too. It seemed that Priestley really got into his stride at this point. The interactions between the characters, particularly between Billy and Mister Creecher, were incredibly well-thought out and the conversations seemed realistic. Or, at least, they seemed like the kind of things of 8ft monster and a weedy London scally-wag would talk about. I’ll admit I’ve not really thought about it that much. And this is where I go back to my metafiction comment. My first reaction was: Whaaaaaaaat? I’m all for twists, in fact, I love twists. I love when everything you think is right turns out to be wrong and you can imagine the author sat on a red velvet chair in a dusty castle turret, laughing like a pantomime villain* at all the silly readers who thought they were so clever. I would happily eat my reviewer’s bonnet if anyone who read this book can honestly say they guessed that ending. But I’m not saying anything else because, if you ever read this book (you should- you might like it more than I did! ), I would love to see your reaction at it. Maybe it’s just me being incredibly dense and not seeing the signs and clues, but I was a flabbergasted. Kudos to Mr Priestley for having the guts to write it but I’m just not sure. Also, while I’m grumbling, I feel a bit let down by the ending. No questions were really answered and there were so many things, important things, that I wanted to be resolved. I’m not saying that everything in a book should be resolved but…. At least a few things should be. I wonder if there will be a sequel? Um… oh wait, there is a sequel. And you may have heard of it. All in all, this book wasn’t for me. But, seeing as it’s obvious from this book alone that Mr Priestley can definitely write his way out of a horror paper bag (and, probably one of those Bag for Life bags), I will definitely be reading more of his books. I’ve had [book:The Dead Of Winter|8663299] lurking on my Kindle for a while now and I can’t wait to read it. *This may or may not be how Mr Priestley writes his books. I kind of hope so, though. I received a copy of this book from Bloomsbury. Thank you! Now I HAVE to know about that ending! Yeah, seriously. I really want to know the ending. Love the image of the author as a trickster writing maniacally to scare readers:) All I can think about when I see Creecher is Kreacher from Harry Potter. I'm sure once I started reading this, that would be out the window, though. And I totally agree that setting-wise, it doesn't get much better than Victorian London. Pahaha, I think you'd have fun with this one Flann. The setting is amazing though. I really want to go on one of those Victorian London walks. WHEN you find yourself on British shores we have to go on one. Preferably one of the ones that have a tour guide who is dressed up as Dickens or something. I'm glad to have amused you with the ending! Thanks for the mostly very generous review. But it's 1818 – Regency London not Victorian. It's the world of Shelley, Byron and Keats. Hope that doesn't make it less interesting to any potential readers out there. I really want to read his 'Tales of Terror' books, they look amazing.